Nissan will begin selling electric cars in Oregon state as early as 2010, according to a statement by Nissan-Renault CEO Carlos Ghosn at the LA Auto Show. There's been a lot buzz surrounding Nissan electric cars, especially with the debut of the Nissan Denki Cube concept at the New York Auto Show earlier this year. Oregon's governor Ted Kulongoski is recommending the state replace the $1,500 hybrid tax credit with a $5,000 electric vehicle credit, essentially subsidizing part of the cost of the vehicle. 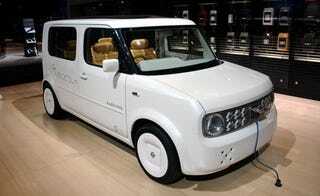 Nissan also plans a larger scale production of electric cars by 2012. Details in the statement from Nissan below. LOS ANGELES (Nov. 19, 2008) – Carlos Ghosn, president and CEO, Nissan Motor Co., Ltd., today announced a new electric-vehicle partnership with the state of Oregon, in line with Nissan’s commitment to begin offering pure electric cars in 2010 in the United States and Japan. The announcement came in a keynote address at the opening of the 2008 Los Angeles Auto Show. “We see in Oregon the vision that is evident in all the places that are eager for sustainable mobility,” said Mr. Ghosn. “Demonstrating their care for the environment, the state and its partners are creating the conditions that will promote zero-emission vehicles as an attractive choice for consumers.” Nissan will launch its first electric vehicle in Oregon in late 2010. Oregon Gov. Ted Kulongoski is proposing replacing the current $1,500 tax credit on hybrid vehicles with a $5,000 credit on all-electric cars.